According to the US Energy Information Administration, the primary cause of the downward trend in coal inventories has been the retirement of coal-fired generating capacity. Greg Goebel photo via Wikimedia Commons. Source: U.S. Energy Information Administration, Short-Term Energy Outlook, August 2018. In May 2018, coal inventories, or stockpiles, in the electric power sector totalled 128 million short tons (MMst), 34 MMst (21 per cent) lower than in May 2017, and the lowest at that time of year since 2014. Stockpiles have averaged 35 MMst (22 per cent) lower during the first five months of 2018 compared with 2017. Coal inventories typically follow a seasonal pattern, increasing during the spring and fall when electricity demand is relatively low and decreasing during the summer and winter when electricity demand is relatively high. Since the start of 2016, however, the amount of coal stockpiled at electric power plants has been decreasing. 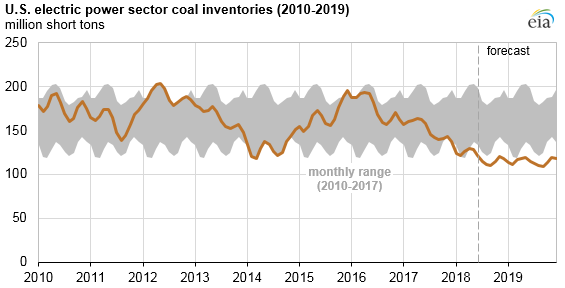 Although fluctuations in electricity demand and coal deliveries can affect the levels of coal stockpiles, the primary cause of the downward trend in inventories has been the retirement of coal-fired generating capacity. Source: U.S. Energy Information Administration, Preliminary Monthly Electric Generator Inventory. Nearly 31 gigawatts (GW) of coal-fired capacity retired between 2014 and 2017, approximately 10 per cent of the coal-fired capacity that existed in 2014. 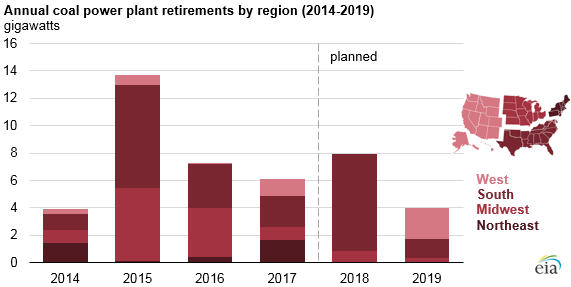 Most of these retirements were in the Midwest and South census regions. Between 2014 and 2017, end-of-year stockpiles of coal in the electric power sector decreased 10 per cent, from 152 MMst to 137 MMst. Regionally, the largest decline in end-of-year stockpiles was in the South, which saw a 14 MMst (20 per cent) decrease. Coal stockpiles fell by 5 MMst (52 per cent) in the Northeast. In each month’s Electricity Monthly Update, EIA calculates how long these stockpiles would last assuming no additional coal was received. This value, known as days of burn, considers each plant’s current stockpile level and its estimated consumption rate in coming months. EIA estimates the historical burn rate by averaging the most recent three years of historical data and applying that rate to the upcoming months. As of May 2018, more than half of coal-fired capacity had at least 60 days of burn, with the average near 75 days of burn. In EIA’s August Short-Term Energy Outlook, coal stockpiles are forecast to continue to decline through 2018 and to remain low through 2019. By the end of 2018, an additional 7.9 GW of coal-fired capacity is expected to retire. Nearly 90 per cent of the expected capacity retirements in 2018 occur in the South. An additional 4 GW of coal-fired capacity is expected to retire in 2019, with 57 per cent occurring in the West region and 35 per cent occurring in the South. More information from EIA’s coal and electricity industry surveys can be found in EIA’s interactive coal data browser and electricity data browser.